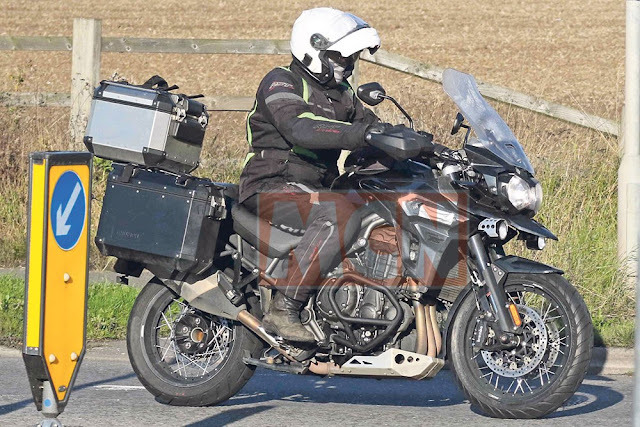 The next-generation of Triumph Tiger Explorer will feature a hugely expanded range and a host of technical and styling changes as revealed in these spy pictures of the two top-of-the-range models undergoing tests. Triumph look set to follow the template set by the Tiger 800 family, with alloy-wheeled versions gaining an XR postscript to their name while the more off-road focused models will be dubbed XC. As with the Tiger 800, we’re expecting each to be offered in three flavours. The XR line will include the base-model Explorer XR along with a mid-line Explorer XRx and range-topping Explorer XRT while the XC versions will be the Explorer XC, Explorer XCx and Explorer XCA. The bikes you see here are the top models in their respective ranges – the Explorer XRT and XCA. The XRT is clearly completely finished, right down to its paintwork and badges. As well as the WP suspension, it gets new Brembo radial brakes, restyled wheels, an electric screen, new mirrors, reshaped exhaust and redesigned bodywork. Lower-spec bikes will also get all the same cosmetic changes. The XCA spied isn’t production-ready, but it’s still indicative of the final bike. 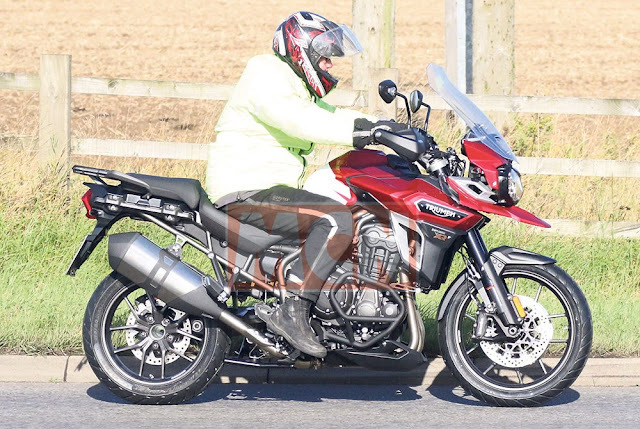 As you’d expect, it gets the same alterations as the XRT model, but in XCA form – the A is for Adventure – it gains aluminium panniers, extra lights, a bashplate and handguards as well as engine protector bars. Under the skin, the bikes all gain a reworked 1215cc triple with improved traction control and multiple riding modes. Triumph are also likely to be gunning to include tech like cornering ABS to match its rivals.